Access your inner wisdom and the passionate Soul Force that arises with it. In a fun and playful atmosphere we create a series of Soul Visioning collages- each one on a small card. Our spontaneous imagery bypasses our chatty mind, revealing what our deeper self wants to express in our lives. Ingenius ‘right brain’ exercises unpack our images and deliver their messages. Through the magic of synchronicity our own unique ‘Spirit Cards’ give us a ‘reading’ of our present situation. Soul Visioning reveals solutions to our dilemnas, allies that can help us in our journey, our unique medicine and the gifts we came to give, our Dharma and our destiny. Create SOUL STIRRING and SPIRIT INSPIRED Vision Cards that catalyze your next step! 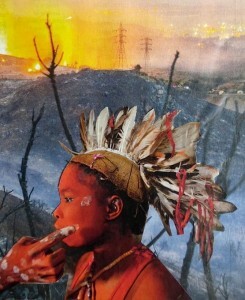 Dana Lynne Andersen has been teaching collage since 1987. Over the years she has shared the soul stirring and spirit inspired approach of Soul Visioning with hundreds of students from around the world. Dana has a Masters Degree in Consciousness Studies from John F. Kennedy University and she has taught and exhibited on three continents. She is the founder of Awakening Arts Academy (USA) and Arte Spirito; the Academy of Art, Creativity & Consciousness (Italy). She is known as a powerful and loving teacher.